AMMONNEWS - US Secretary of State Mike Pompeo said on Monday that President Donald Trump’s threat to devastate Turkey economically should it attack a Washington-backed Kurdish militia in Syria would not change plans to withdraw troops from that country. Pompeo said he had told Saudi Arabia's king and crown prince during morning meetings that “every single person who has responsibility for the murder of Jamal Khashoggi needs to be held accountable”. Analysts have told Al Arabiya English that while the grisly murder of the late Saudi journalist has been a sour point in the relationship between Washington and Riyadh in recent months, ties would endure given the strategic benefit for both countries. “The Saudi-American relationship is historical and deeply-rooted. It has seen many challenges over the years, I would say stronger than the Khashoggi episode and it has endured and even became stronger,” Prince Abdullah bin Khaled al-Saud, director of research at the King Faisal Center for Research and Islamic Studies, told Al Arabiya English. “I think it is a relationship that is important for the stability of the region,” he added. Pompeo’s visit to the region comes after the decision of the US to withdraw 2,000 of its troops from Syria. At the same time, the secretary of state is pushing a Trump administration hope in establishing a coalition consisting of the GCC states, Egypt, and Jordan, naming it the “Middle East Strategic Alliance” (MESA). The withdrawal has come at a sensitive time, especially with Syrian Kurds fearing that any void left would leave them vulnerable in front of Turkey. But Pompeo told Al Arabiya that a big part of his regional tour was to ensure that the forces which they fought with in the region are protected from threats from all folks in the region. “We are trying to create an orderly, successful, deliberate departure of our forces. 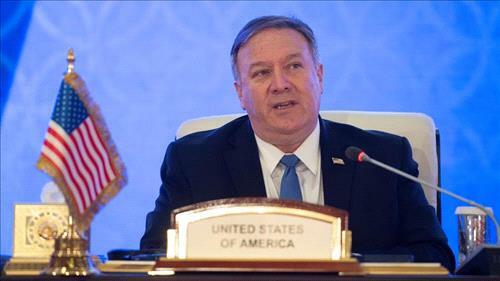 And I am confident that we can do that and the conversations with the Turks, in that respect, have been very productive,” Pompeo told Al Arabiya. “What marked Pompeo’s interview with Al Arabiya is the point when he emphasized that the ‘Syrian Kurds are not terrorists’. This will have an impact on the ground. That would mean that all Turkish actions which are related to the Kurdish file in Syria will be well calculated,” he said. Other analysts say that Pompeo’s efforts in appeasing the Kurds might fall short, especially in the northern region of Syria as Turkey aims to push forward with a campaign against Kurdish forces that have allied with the United States in the past. “The problem that we've got is this kind of slightly two-faced approach from the Americans. My view is that I think the US is signaling from the top that the Syrian Kurds would have to probably fend for themselves,” said Michael Stephens, a research fellow at the Royal United Services Institute for Defence and Security Studies.